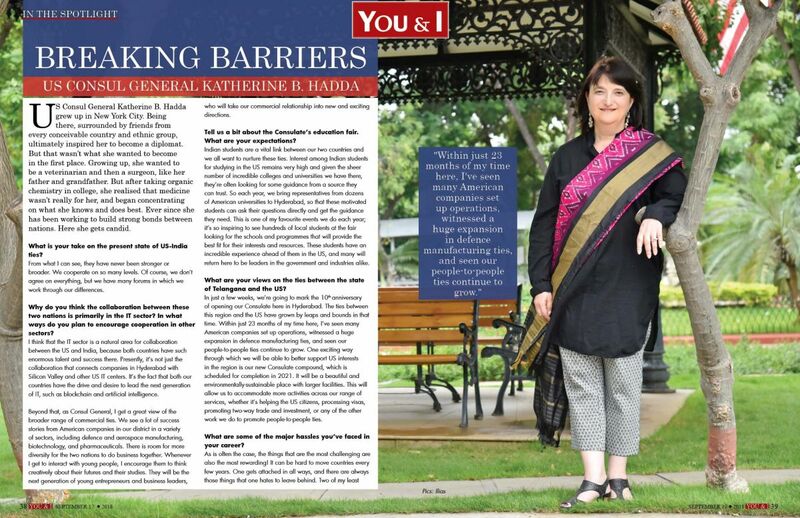 US Consul General Katherine B. Hadda grew up in New York City. 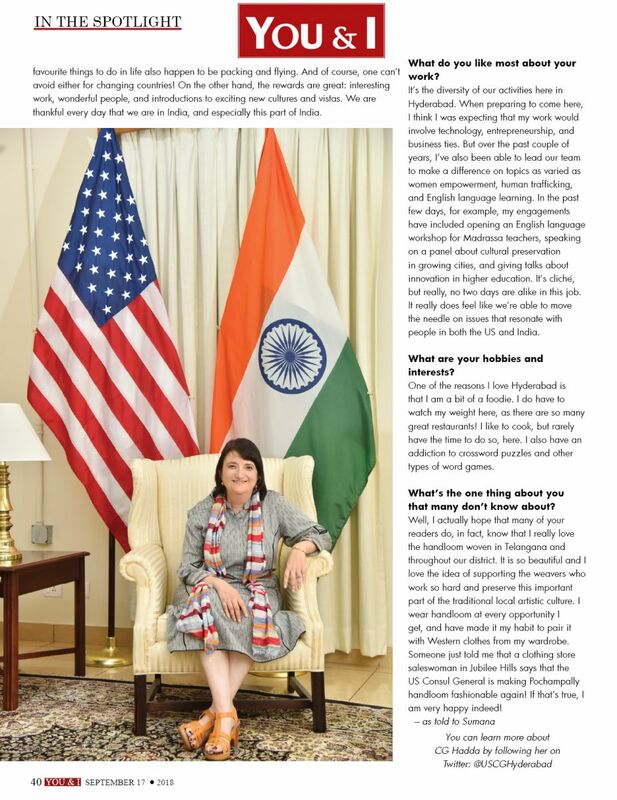 Being there, surrounded by friends from every conceivable country and ethnic group, ultimately inspired her to become a diplomat. But that wasn’t what she wanted to become in the first place. Growing up, she wanted to be a veterinarian and then a surgeon, like her father and grandfather. But after taking organic chemistry in college, she realised that medicine wasn’t really for her, and began concentrating on what she knows and does best. Ever since she has been working to build strong bonds between nations. Here she gets candid. What is your take on the present state of US-India ties? From what I can see, they have never been stronger or broader. We cooperate on so many levels. Of course, we don’t agree on everything, but we have many forums in which we work through our differences. Why do you think the collaboration between these two nations is primarily in the IT sector? In what ways do you plan to encourage cooperation in other sectors? I think that the IT sector is a natural area for collaboration between the US and India, because both countries have such enormous talent and success there. 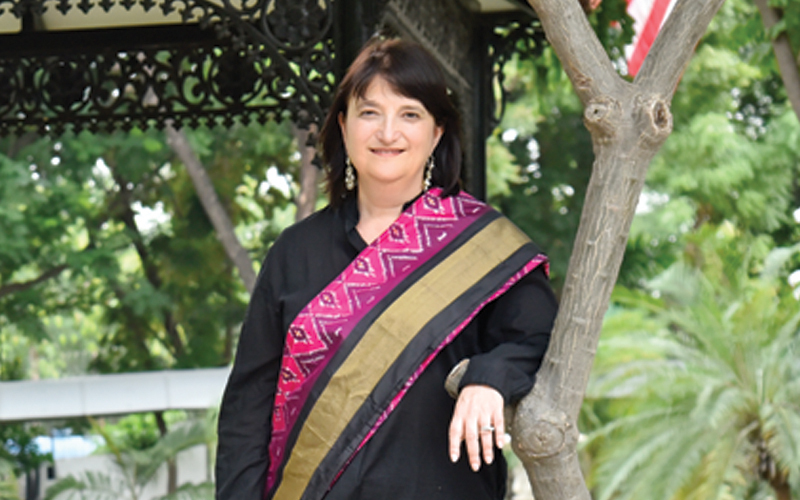 Presently, it’s not just the collaboration that connects companies in Hyderabad with Silicon Valley and other US IT centers. It’s the fact that both our countries have the drive and desire to lead the next generation of IT, such as blockchain and artificial intelligence. Beyond that, as Consul General, I get a great view of the broader range of commercial ties. We see a lot of success stories from American companies in our district in a variety of sectors, including defence and aerospace manufacturing, biotechnology, and pharmaceuticals. There is room for more diversity for the two nations to do business together. Whenever I get to interact with young people, I encourage them to think creatively about their futures and their studies. They will be the next generation of young entrepreneurs and business leaders, who will take our commercial relationship into new and exciting directions. Tell us a bit about the Consulate’s education fair. What are your expectations? Indian students are a vital link between our two countries and we all want to nurture these ties. Interest among Indian students for studying in the US remains very high and given the sheer number of incredible colleges and universities we have there, they’re often looking for some guidance from a source they can trust. So each year, we bring representatives from dozens of American universities to Hyderabad, so that these motivated students can ask their questions directly and get the guidance they need. This is one of my favourite events we do each year; it’s so inspiring to see hundreds of local students at the fair looking for the schools and programmes that will provide the best fit for their interests and resources. These students have an incredible experience ahead of them in the US, and many will return here to be leaders in the government and industries alike. What are your views on the ties between the state of Telangana and the US? In just a few weeks, we’re going to mark the 10th anniversary of opening our Consulate here in Hyderabad. The ties between this region and the US have grown by leaps and bounds in that time. Within just 23 months of my time here, I’ve seen many American companies set up operations, witnessed a huge expansion in defence manufacturing ties, and seen our people-to-people ties continue to grow. One exciting way through which we will be able to better support US interests in the region is our new Consulate compound, which is scheduled for completion in 2021. It will be a beautiful and environmentally-sustainable place with larger facilities. This will allow us to accommodate more activities across our range of services, whether it’s helping the US citizens, processing visas, promoting two-way trade and investment, or any of the other work we do to promote people-to-people ties. What are some of the major hassles you’ve faced in your career? As is often the case, the things that are the most challenging are also the most rewarding! It can be hard to move countries every few years. One gets attached in all ways, and there are always those things that one hates to leave behind. Two of my least favourite things to do in life also happen to be packing and flying. And of course, one can’t avoid either for changing countries! On the other hand, the rewards are great: interesting work, wonderful people, and introductions to exciting new cultures and vistas. We are thankful every day that we are in India, and especially this part of India. It’s the diversity of our activities here in Hyderabad. When preparing to come here, I think I was expecting that my work would involve technology, entrepreneurship, and business ties. But over the past couple of years, I’ve also been able to lead our team to make a difference on topics as varied as women empowerment, human trafficking, and English language learning. In the past few days, for example, my engagements have included opening an English language workshop for Madrassa teachers, speaking on a panel about cultural preservation in growing cities, and giving talks about innovation in higher education. It’s cliché, but really, no two days are alike in this job. It really does feel like we’re able to move the needle on issues that resonate with people in both the US and India. One of the reasons I love Hyderabad is that I am a bit of a foodie. I do have to watch my weight here, as there are so many great restaurants! I like to cook, but rarely have the time to do so, here. I also have an addiction to crossword puzzles and other types of word games. What’s the one thing about you that many don’t know about?